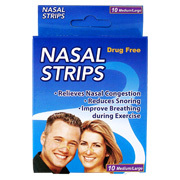 Nasal Strips help improve breathing by gently opening nasal passages. 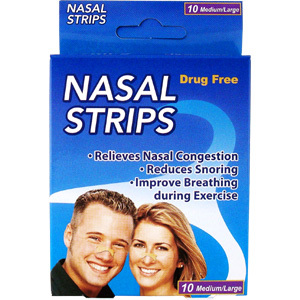 Nasal Strips relieve nasal congestion due to sinus colds and allergies, and may reduce or eliminate snoring. 1. Thoroughly wash and dry nose area. Any wetness, facial oils or make-up can reduce the effectiveness of the nasal strips. 2. 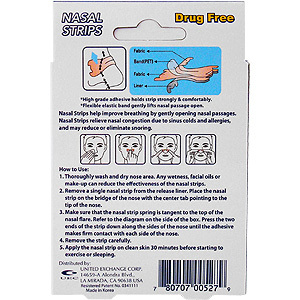 Remove a single nasal strip from the release liner. 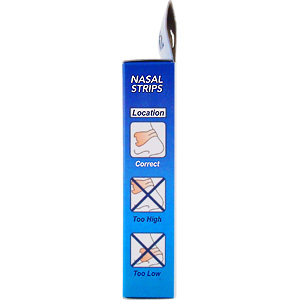 Place the nasal strip on the bridge of the nose with the center tab pointing to the tip of the nose. 3. 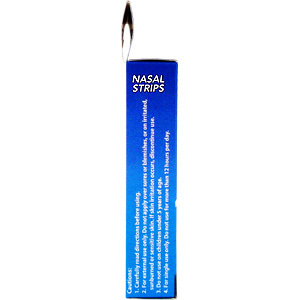 Make sure that the nsal strip spring is tangent to the top of the nasal flare. Refer to the diagram on the side of the box. Press the two ends of the strip down along the sides of the nose until the adhesive makes firm contact with each side of the nost. 4. Remove the strip carefully. 5. Apply the nasal strip on clean 30 minutes before starting to exercise or sleeping. Nasal Strips is shipped in a discrete, unmarked package. Orders are processed immediately and usually take about 3 to 5 working days to be received. Any information received is used only for order processing and shipping purposes. Your information, such as e-mail address, will never be disclosed to a third party.